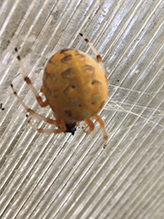 This is a medium-sized orb weaver spider. Females are much larger than males, ⅜″ to 11 ⁄16″ long and 1 ⁄16″ to ¼″ wide, with a legspan up to 17 ⁄16″. Males are about half as big, ¼″ to ⅜″ long and 1 ⁄16″ to ⅛″ wide. Like all spiders, it has two body parts. 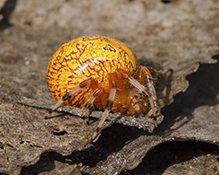 The hardened plate (carapace) covering the front part (cephalothorax) is light brown or orange with a narrow dark stripe down the middle and on each side. The abdomen is and rounded and smooth, with no bumps toward the rear. On the female it is large and rounded. On the male it is proportionately smaller and more elongated. The color and pattern of the abdomen is highly variable both regionally and seasonally. It has a white, yellow, orange, brownish, or pink background color. There are always highly contrasted black, gray, and white markings, at least at the front edge, that give it a marbled appearance. These markings may fade as the season progresses. The legs are 11 ⁄16″ to 17 ⁄16″ long and spiny. Males have proportionally longer legs than females. The ends of the legs are banded with black and either clear or white. The third (femur) and fourth (patella) leg segments are often light brown or orange, the same color as the carapace. Sometimes these segments are banded. The face is small. There are eight eyes, all of them small, in two rows. Several hundred orange eggs are deposited in a mass and then wrapped in silk producing a flattened spherical egg sac. The egg sac is then attached to nearby vegetation or to the spider’s retreat. Some eggs hatch in late summer or fall, others overwinter in egg sacs. Spiderlings disperse by “ballooning”. They climb a branch, blade of grass, or fencepost, and release a long thread of silk. The silk thread catches the wind or even a light breeze and the spiderling floats to a new site. Adults are active from mid-summer to the first hard freeze in fall. They spin a large circular web that hangs vertically. This web is called an “orb”, which gives this family of spiders its common name. The orb is typically a closed hub, 20″ to 30″ in diameter, with 15 to 35 spokes (radii) that are not sticky. The radii extend to the center of the hub. They are connected to each other by sticky threads that spiral outward from the center. The spider also makes a retreat out of silk near one edge of the orb. 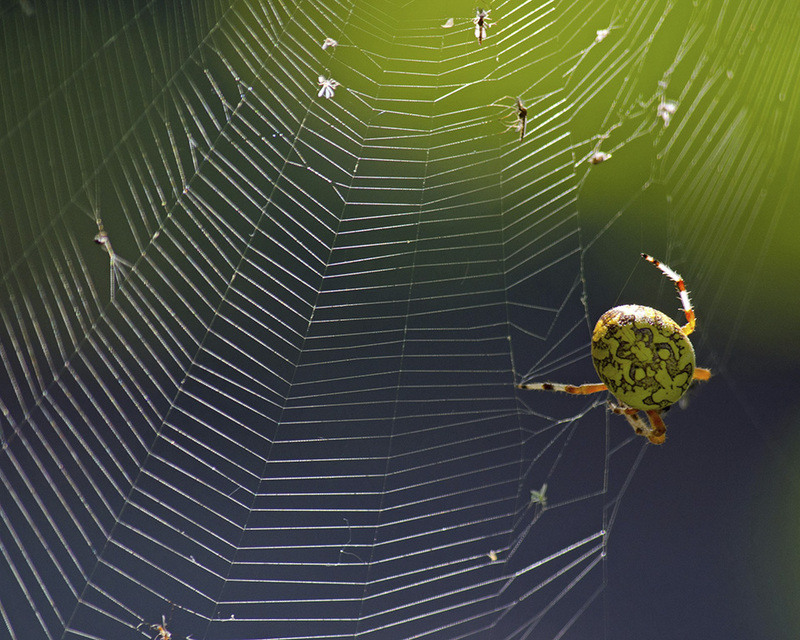 The retreat is connected by a signal thread to the center of the web, allowing the spider to feel vibrations of prey. 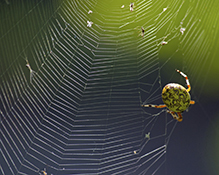 The web is usually consumed and a new web constructed each evening. They will drop to the ground and hide if approached. Males are unable to capture prey larger than themselves. She found a corner in my little greenhouse on the deck. A female was found dining on its catch in a flower garden in our backyard. 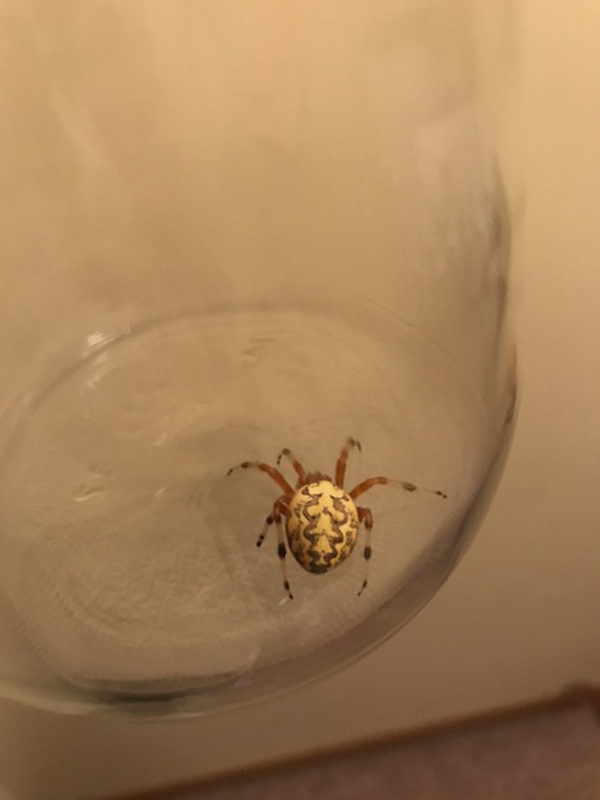 Female found building vertical web in closet doorway. 1/2” long, quarter-sized spread out. Spotted yesterday in Houston County MN close to Hokah. Here is a video of me handling a Marbled Orb-weaving spider. This was filmed in North Carolina. I know this species also exists in Upstate New York. Thanks for watching! 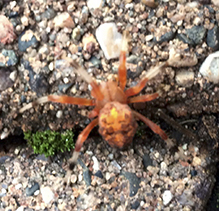 We saw several of these Spider weaving there webs in Uhwarrie National Forest in North Carolina. Found this little lady perched up on my downspout, happily working away on a beetle of some kind. While filming her, I got lucky and got a shot of another beetle flying into her web and her going after it! music : Kevin MacLeod (incompetech.com) Licensed under Creative Commons "Attribution 3.0"
Araneus Marmoreus Var. Pyramidatus found in my garden! 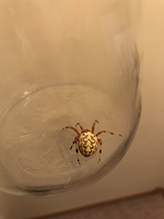 A beautiful spider that I found in my garden: it's an araneus marmoreus var. pyramidatus. It's big! 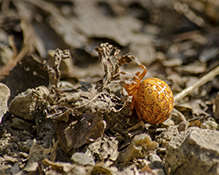 A female Marbled orb-weaver hanging and climbing. Lens: Canon Macro Lens FD 50mm 1:3.5. She was all curled up in a ball in our landscaping rocks. I thought is was a fancy acorn. I brought it in the house and the legs came out!! Wow! She was strolling slowly along our outside doormat. So beautiful! I've lived in the country a long time and I've never seen one prior to today. I've learned a lot about them on this website - thank you! 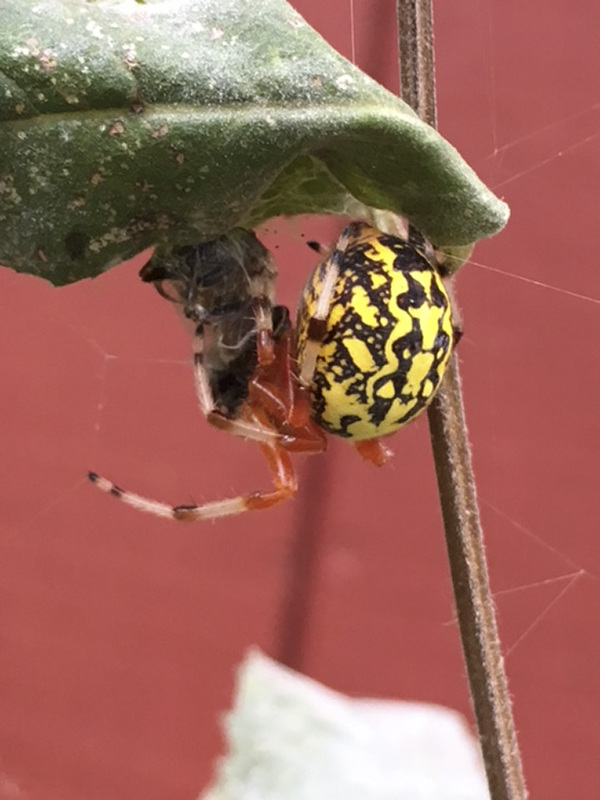 The Marbled Orb-weaver made a large web in the fork of a tree trunk near the Wetland Trail of the Crosby Farm Regional Park. 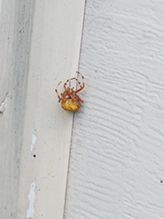 It's web showed signs of damage with evidence that the spider--a female, if I'm not mistaken--had repaired it. 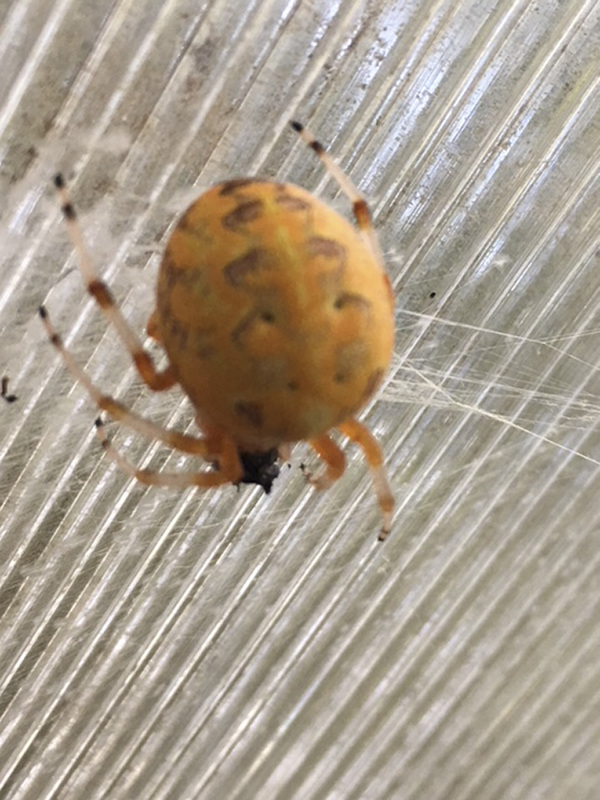 It was spinning a web on the side of our motor-home. Found 7 feet up in a maple tree near its web. It had made a home inside a curved leaf. Location: our doorframe! Montgomery,MN... Le Seuer co. 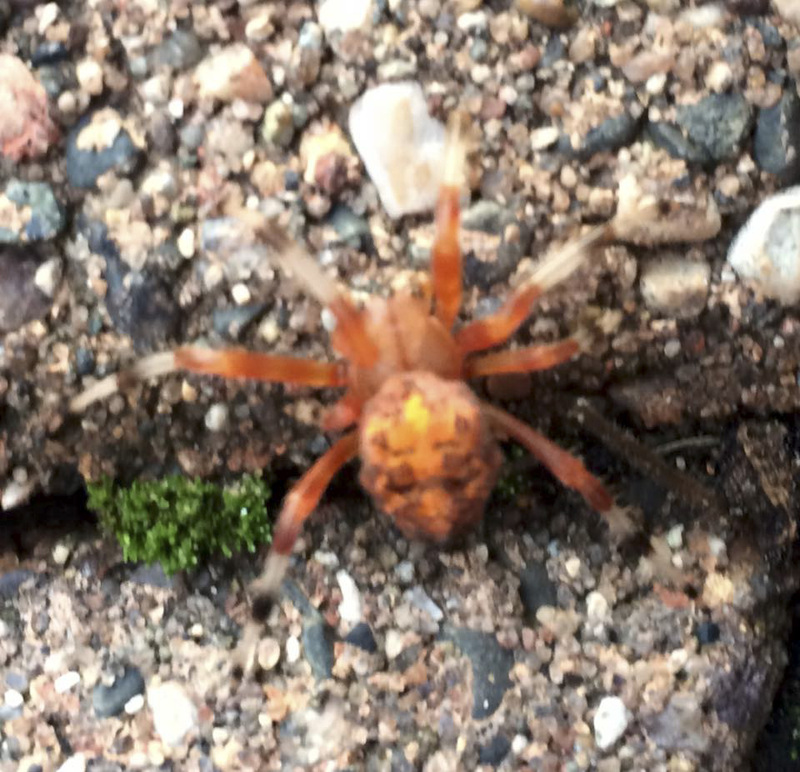 Beautifully bright spider! The first time I have ever seen one, striking!